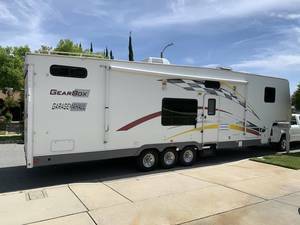 A Toy Hauler RV is a fifth wheel, travel trailer or motorhome with built-in interior cargo space for motorcycles, bikes, and other camping and play toys. A distinguishing feature of a toy hauler is the large door in the back which opens down to create a ramp, or fold-away use are in the main living compartment, and often a third axle. Designed to efficiently haul heavy rec equipment, Toy Haulers can be found for sale across the USA and Canada and from these RVT sellers below.